No Christmas tree is complete without a nice-looking topper. What will you pick this year? 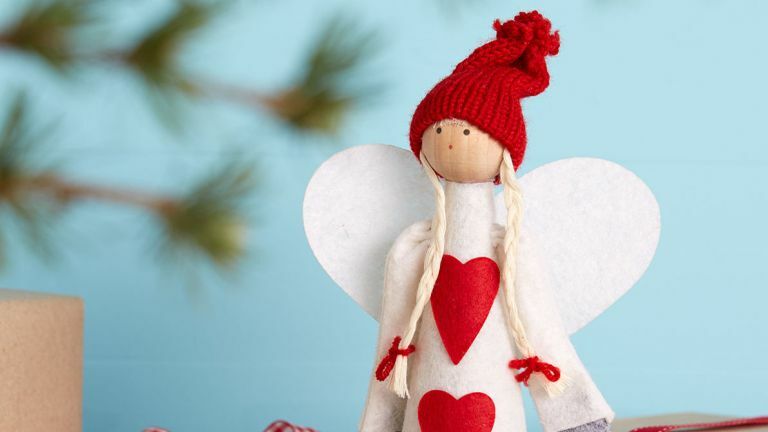 A classic star, or a knitted angel to go with your Scandi decorating scheme? Read our guide to this festive season's prettiest tree toppers. Need ideas first? Check out our Christmas tree decorating ideas. Keep your Christmas tree topper light and delicate in design as part of a minimalist decorating scheme. We love the Star Tree Topper with Lights by Sirius, available from Amara. If you prefer your tree topper to look like a natural extension of your tree, pick one that's decorated with fir branches and/or berries, like this very pretty Berry Star Tree Topper from Dunelm. If subtle isn't your thing, go all out on colour and sparkle with the Ombre Sequin Star Tree Topper by M&Co (the perfect match for kitsch tree decorations, if you ask us). Match your tree topper to the rest of your tree decorating scheme for an elegant finished look. We love the way the Iridescent White Star Christmas Tree Topper from The Contemporary Home completes this pearlescent decorating scheme. Have enough stars? Get yourself a shiny snowflake instead. Our pick is the Metal Snowflake Tree Topper from Sainsbury's Home. Add a bit of interest to the classic star topper with a three-dimensional design. The Tangle Star Christmas Tree Top by Stelton is very sophisticated and made from brass-brushed stainless steel. Available at Black by Design. The perfect match for a Scandi Christmas decorating scheme, we think. To complete a dreamy and atmospheric tree decorating scheme that will look especially stunning at night, pick an LED-lit tree topper. We love the Colour Changing LED Star Tree Topper from B&Q. If you're going for a kitsch Christmas tree decorating scheme this year, then anything goes in terms of your tree topper. How about this delightfully OTT Peacock Tree Topper from TK Maxx? It's more than a little Copacabana, and we love it. Can't get enough of Scandi Christmas? Top if all off (see what we did?) with the Nordic Angel Tree Topper from The Contemporary Home and hope that Christmas will be as peaceful and cosy as your tree. Santa's hat and the top of the Christmas tree are a marriage made in heaven. Our favourite is the very festive Santa Hat Christmas Topper by Three Little Loops, available from Etsy. Going for a minimalist, contemporary Christmas tree decorating scheme this year? The key is to keep things simple, and that applies to the tree topper. For an elegant and unfussy finishing touch to your tree, try the Star! Christmas Tree Topper by The Letter Loft, available at Not On The High Street. They also make the tree toppers in other word options. Doing Christmas on a budget? We bet you won't be able to resist the Wonder Star Tree Topper from Wilko. It's nice and glittery, and it's £2.50. What's not to like?